My mother died several weeks ago, and this is the first year that she is unable to make these pies for us for our holiday celebrations. But with her recipe on hand, the tradition is carried on by my sisters and me. We will make them each year for our own holiday celebrations. You can make your own pie crust from a mix or from scratch, but I just used deep dish pie crusts from the frozen aisle and they worked perfectly. You cook the pie crust first and then add the filling. Once the pie shell has been filled, has cooled and is set well, just add a whipped meringue from the left over egg whites and a bit of sugar. The meringue is best when it is torched. You can do this with a kitchen torch (best results) or simply brown it in the oven under the broiler for color and some extra texture. The pie is a test of patience. It takes a lot of stirring and patience while you wait for the filling to thicken. This is one pie you cannot rush. I tried that one year and ended up with pudding! If you put the filling in the crust too soon, you will have a soupy pudding…cook and stir it long enough and the filling holds well in a cross between a mousse and a cheesecake. 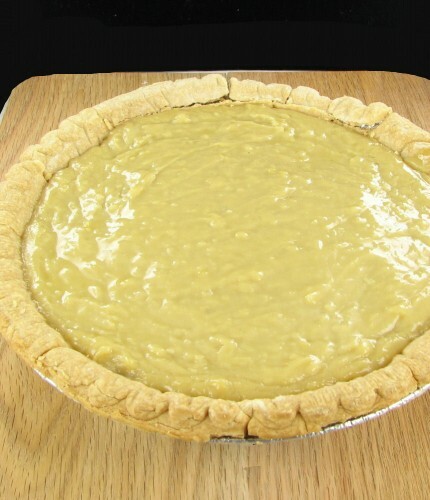 But other than the stirring needed, the pie is pretty easy to make. Believe me, once you have made it once, you will want it again and again, in spite of the time it takes to make it. The pie is full of flavor. It is not overly sweet but still satisfies those with a sweet tooth. 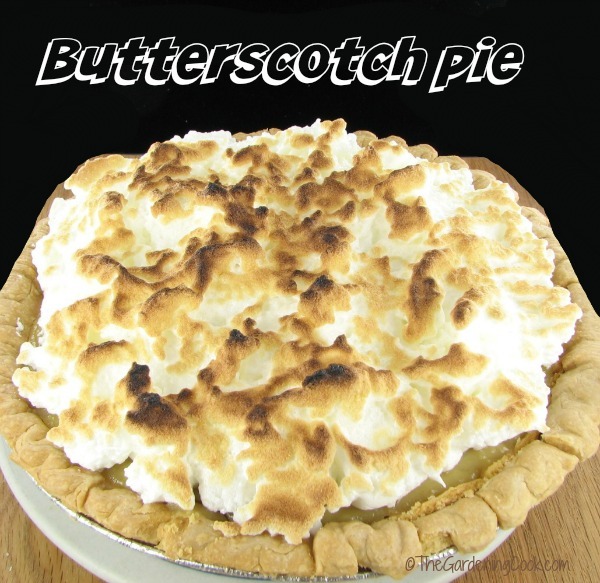 The filling is very much like a rich butterscotch pudding and the torched meringue topping adds a light ending to the taste. So worth the effort, believe me. 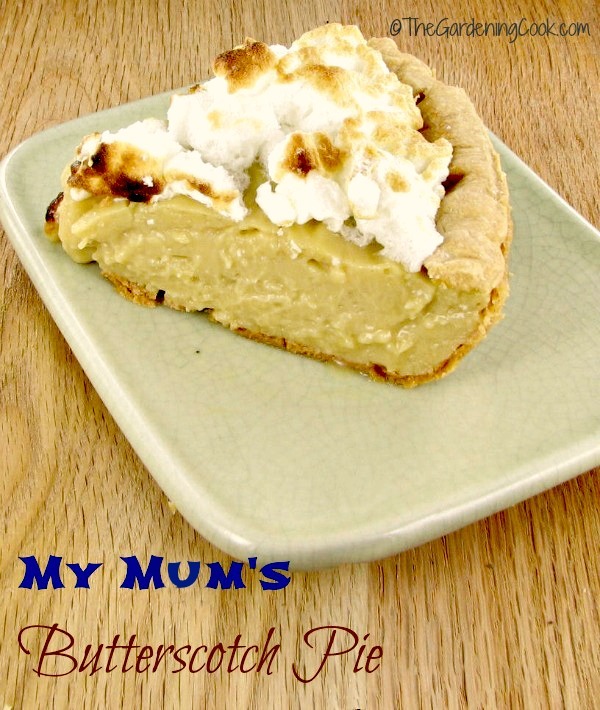 You will love this pie! The recipe makes one pie but can easily be doubled. ¾ of a 1 lb package of light brown sugar (dark brown is fine too. It makes a darker pie) You can vary the brown sugar as to how sweet you want the pie so a bit more or less than ¾ of a box is fine. Whisk the egg yolks. Add a pinch of salt and cornstarch and mix well to combine into a paste. Place the half and half in a saucepan over a medium heat and add the butter and brown sugar Cook until the butter melts. Add the egg mixture. Stirring constantly, cook until the mixture is quite thick. You may need a bit more milk or half and half at this stage if it is too thick. It should be quite thick, sort of like a cheesecake. Remove from the heat and add the the vanilla extract. Allow it to cool slightly. Place in the cooked pie shell and set aside. Whisk the egg whites with the granulated sugar until stiff peaks form. 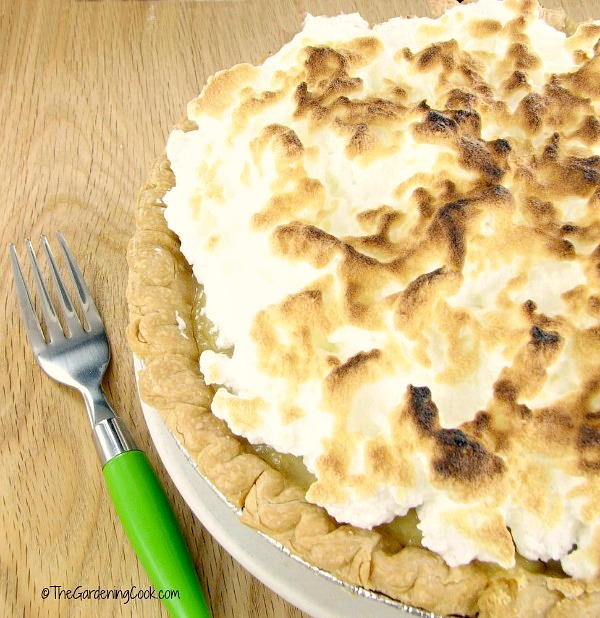 Spread on top of the pie and place in a preheated 350º oven for a few minutes until the meringue gets lightly toasted. How much brown sugar in measured in cups. You say 3/4 package brown sugar. How big of a package? We can buy them here if one or two pound packages. Could you please e mail me back and let me know.